North Africa or Barbary II Algier. This is a scarce and beautiful 1834 Society for the Diffusion of Useful Knowledge or S.D.U.K. 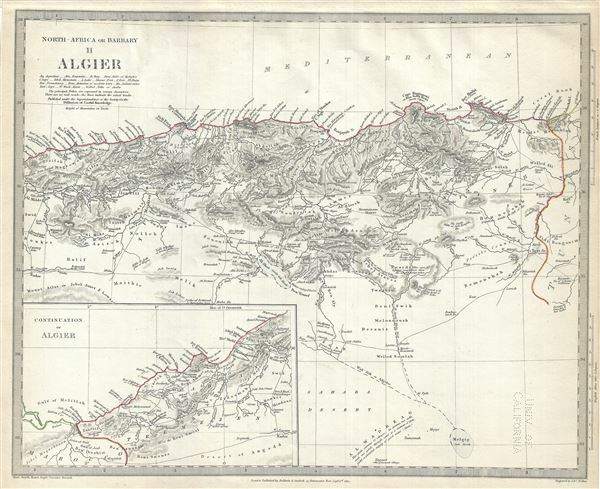 map of Algeria on the Barbary Coast of northern Africa. It covers from the Mediterranean Sea south to the Sahara Desert and the Melgig Salt Marsh and from the Desert of Angadd east as far as the border of Tunisia. Throughout the map identifies various cities, rivers, lakes, early roads, mountains and an assortment of additional topographical details. Elevation is rendered by hachure. The western part of Algeria is covered in an inset in the bottom left quadrant. Throughout the map includes several annotations regarding the topography and geographical features. Long a hotbed of piracy and a center for the Slave trade, the Barbary coast, including the Maghreb, was being conquered by France as this map was drawn. Frances tenuous conquest of Tunisia and Algeria in 1830 finally ended the threat of the Barbary Corsairs. After its conquest by the French in 1830, Algeria became an attractive destination for European immigrants. However the majority indigenous Muslim population was dissatisfied with the political system. This dissatisfaction would ultimately trigger the Algerian War and lead to Algeria's independence from France. This map was originally published by Baldwin and Cradock and copyrighted in 1834, but was issued in Volume two of Chapman and Hall's 1844 edition of Maps of the Society for the Diffusion of Useful Knowledge. It was engraved by John Walker of J. and C. Walker. Rumsey 0890.113. Phillips (Atlases) 794.